A team of U of T students won first place at the Mac Design League Designathon 2019 hosted at McMaster University in January, with a design for shielding cameras on surveillance aircraft. The team, dubbed “The Avengineers,” was composed of undergraduate students Nick Bajaikine, Kyle Damrell, Christopher Tong, and Mubtaseem Zaman, each enrolled in engineering programs. 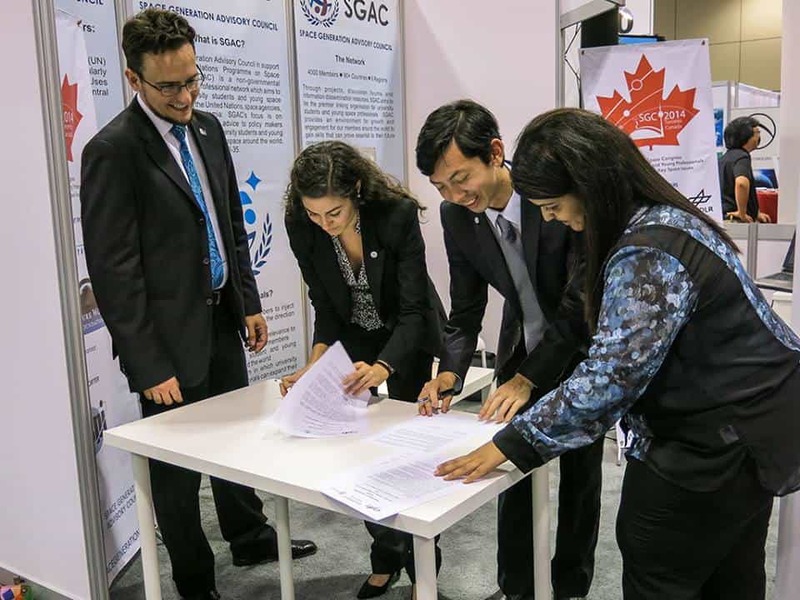 Over a period of 36 hours from January 19–20, they competed against 243 other students from across Ontario to solve real-world problems presented by industry sponsors of the event. McMaster’s designathon was originally created in response to the popularity of hackathons. 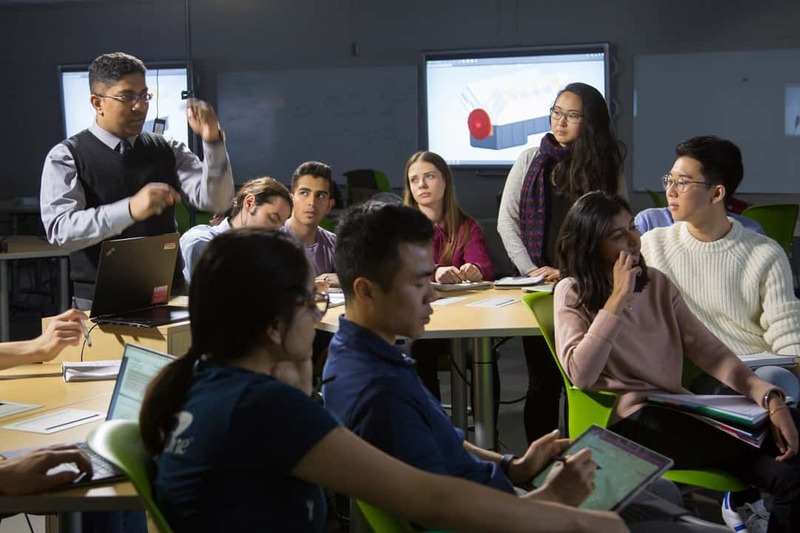 Whereas hackathons focus on programming skills, the Mac Design League sought to create a multidisciplinary outlet for students to showcase their talents in mechanics and design. Featured challenges included designing EpiPens and lunar rovers. The victorious U of T team was tasked with designing a way to shield cameras attached to the bottom of military planes from being damaged in the event of landing-gear failure or ‘soft-crash’ landing. The challenge was posed by aerospace imaging firm L3 Wescam, an aerospace imaging firm which works with defence and military agencies around the world, posed the challenge to the team. “Intuitively, the idea that comes in [first] is to make a mechanism that pulls the camera inside the aircraft and keeps it safe, like an elevator mechanism,” said Zaman in an interview with The Varsity. Zaman explained that many of their opponents attempted solutions along these lines. However, the team eventually noticed that such a solution might not be easy to adapt to other planes. Zaman said that their next idea, which involved releasing the camera when it senses an impending crash landing was also scrapped, due to concerns that the camera might be lost or could injure someone if dropped. Zaman added that this would not only save the camera in worst-case scenarios, but increase its functionality by allowing for surveillance photography from multiple angles. This flexible design ultimately netted the team the top prize, as well as additional opportunities from competition sponsors. The team was invited to present their unique solution to company executives at L3 Wescam’s secure facility, and were each awarded a $300 gift card from sponsor 3D Printing Canada. Plans are also in early development for U of T’s own designathon, to be held next year. The Myhal Centre for Engineering Innovation & Entrepreneurship exemplifies an architecture that is quiet and understated, so that the focus remains on the activities that will occur within it and not on the building itself. This was the premise for the Myhal Centre, named after U of T alumni George and Rayla Myhal, which officially launched in May since plans for its construction were first drawn out ten years ago. Chief architects Robert Davies and Peter Clegg drew inspiration from Canadian-born painter Agnes Martin for the design of the Myhal Centre. Martin’s work drew inspiration from Western and Chinese Classicism, sharing the belief that perfection can only exist in the mind. At first glance, Martin’s paintings aspire to engineering precision, but a closer look reveals freely drawn lines and purposeful imperfections. In a similar sense, Davies and Chegg designed the Myhal Centre to an idea of engineering precision while encouraging the messy and chaotic activities of human beings. Most of the spaces in the Myhal Centre are managed by the Faculty of Applied Science & Engineering, while others, like the classrooms and Technology Enhanced Active Learning (TEAL) rooms, are managed by Academic & Campus Events. As such, many courses that will be taught in the new building this fall not only include engineering, math, and computer science, but also archaeology, kinesiology, and earth science. Aside from its architectural ingenuity, the Myhal Centre is also one of U of T’s most ‘green’ buildings — it has features like cisterns to collect and recycle rainwater, solar panels, and a green roof. The Skule Arena on Level 0 was supported by a $1 million donation from the Engineering Society, the undergraduate student government of the Faculty of Applied Science & Engineering. The Skule Arena is an interactive space that will support over 100 clubs and teams U of T Engineering students are a part of. 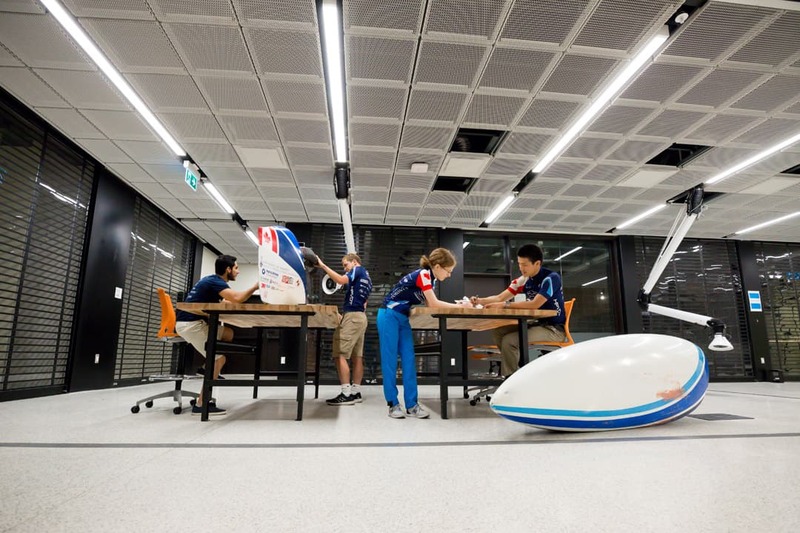 Members of the Human Powered Vehicles Design Team are seen here using the Skule Arena to work on their speedbike. This level also features a soundproof room, which musical groups and students can use to rehearse, and the Engineering Society Arena, which has garage-style spaces to support clubs and other student activities. Lockers are on this level and other floors for students to store instruments, materials, or projects. 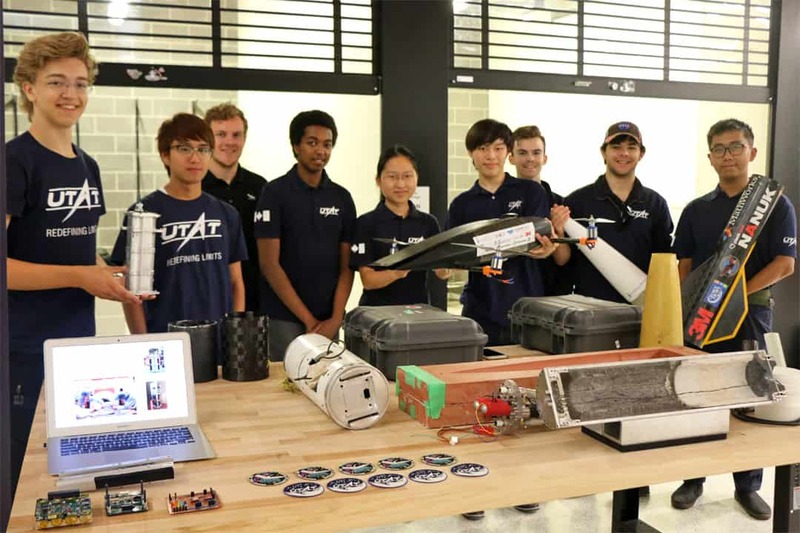 The Skule Arena will support undergraduate teams like the University of Toronto Aerospace Team (UTAT). From left: Jaden Reimer, Timothy Yeung, Ali Haydaroglu, Mohamed Hirole, Madeline Zhang, Justin Hai, Sandy Fogarassy, David Izatt, and Michael Ding. A central theme of this facility is that every space is functional and light pours in from every angle. The foyer on the Level 1 of the Myhal Centre is a prime example of this. This is a space where students can study or meet with other students between classes. 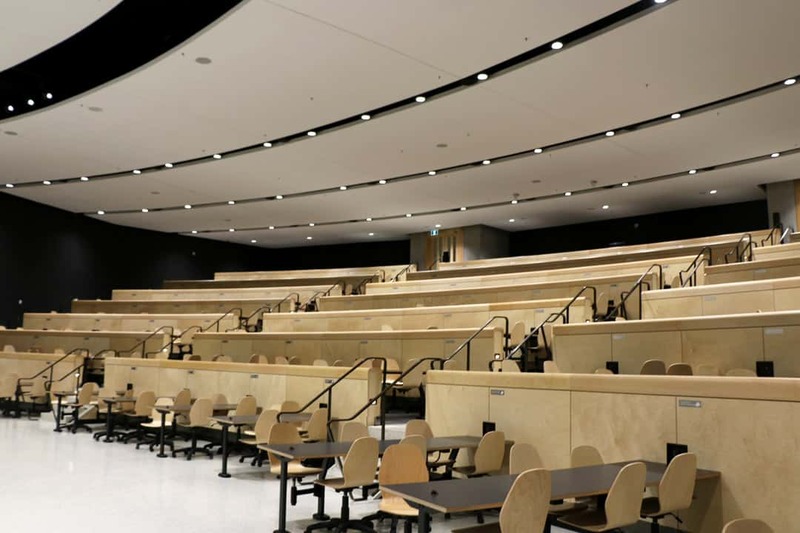 The Lee & Margaret Lau Auditorium is a 468-seat technology enhanced auditorium and is the first of its kind in North America. It doesn’t have your typical blackboard, and instead features a wall-to-wall digital array. Instead of rows, this lecture hall has tables to seat six students.The auditorium can be entered from Level 1 or Level 2. As well, a Second Cup is currently being constructed on Level 2. Here, U of T Engineering Professor Chirag Variwa is seen teaching a class in a TEAL room. Five TEAL rooms are located on Levels 3 and 4 which have screens on every wall and movable tables instead of desks. This flexibility is designed to encourage collaboration that isn’t bound by the classroom’s set configuration. Level 5 houses various design and fabrication facilities, many of which are open outside of regular classroom hours. 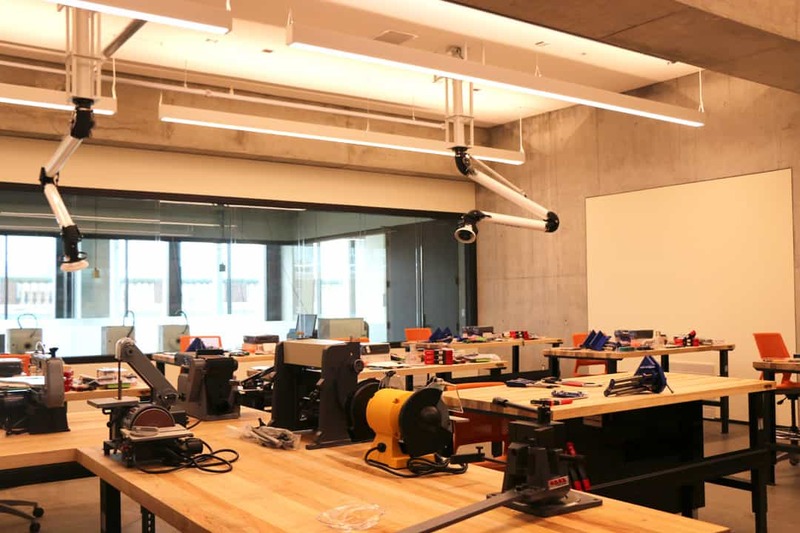 Such facilities include the Light Fabrication Facility where students can build parts out of plastic, metal, or wood, and a Prototype Facility that comes with a laser cutter and 3D printers. 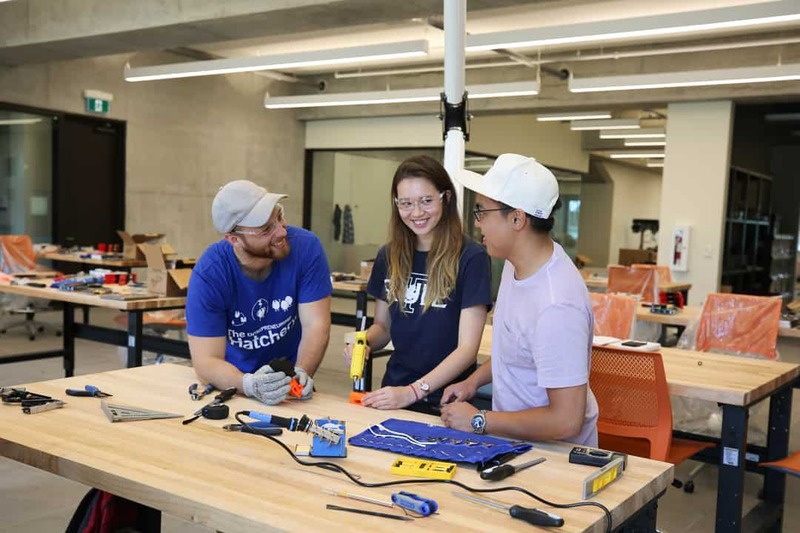 From left: students Stephen Dawes, Stephanie McDonald, and Nicholas Chin are seen here creating a prototype in the Myhal Centre for their startup, Hotbox. The Norris Walker 5T7 Robotics Lab on Level 5 is an atrium space and will be the new home of the Institute for Robotics & Mechatronics, a cross-disciplinary lab centred on robotics research with applications to real-world problems. Applications of such research include socially assistive robots like those developed from the laboratory of Professor Goldie Nejat, and targeted drug delivery systems like those developed from Professor Eric Diller’s research laboratory. The atrium on Level 5 is similar to the foyer in that it’s an open space with tables and desks so that students can work between class time. 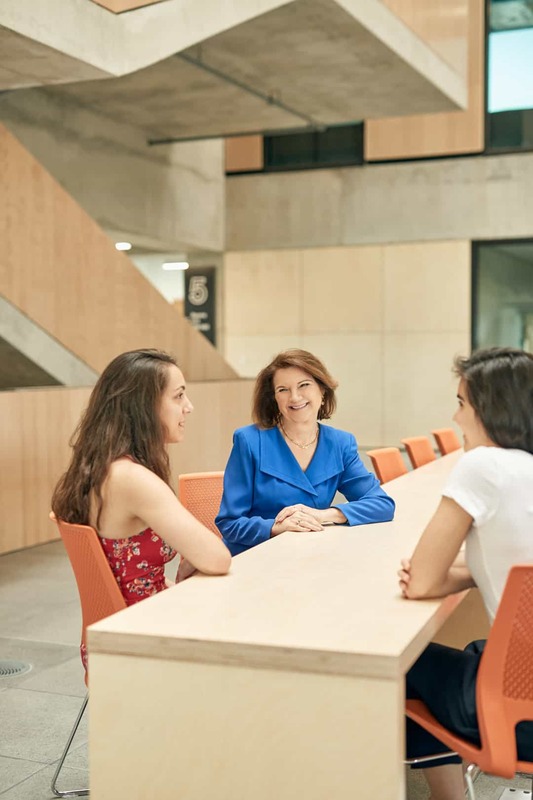 From left: Chloe Oriotis, Dean of the Faculty of Applied Science & Engineering Cristina Amon, and Sabrina Cupryk. 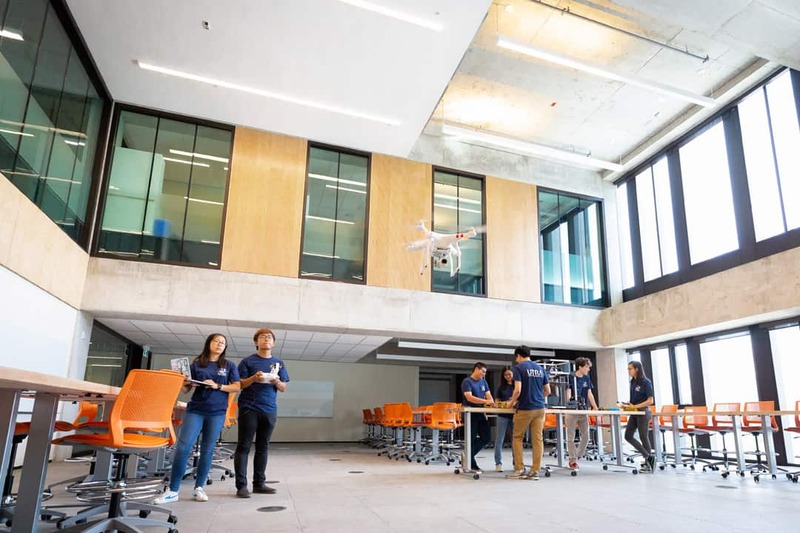 Launched in 2012, the Entrepreneurship Hatchery is one of the largest and most successful startup accelerators at U of T. The Hatchery helps provide startups access to networking opportunities, space, funding, and equipment. Its new space at the Myhal Centre features large, open spaces to facilitate collaboration. Notable startups include Tejo, Knowtworthy, and Column Mods. 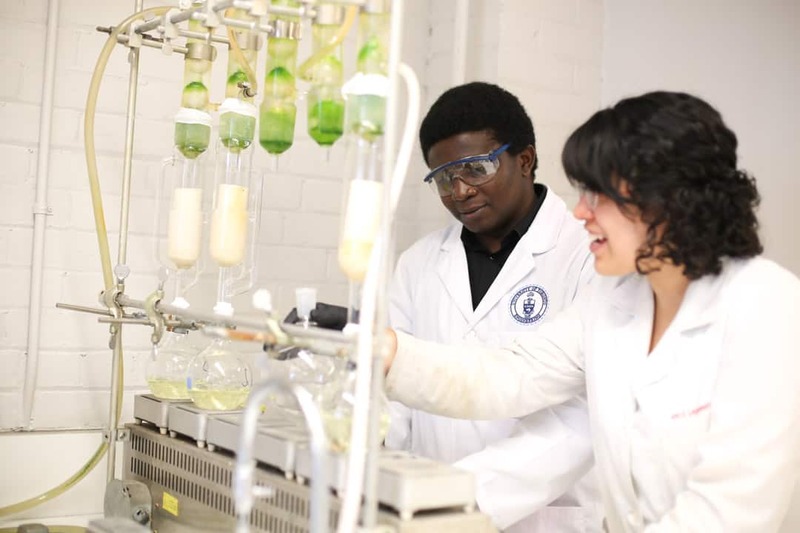 Level 7 is home to the Centre for Global Engineering (CGEN) which enables engineers to solve some of the world’s most pressing issues involving nutrition, sanitation, health, and shelter. One of the centre’s ongoing projects is fortifying foods like tea and salt with iron to prevent and treat anemia. To implement innovative solutions like fortified foods, CGEN partners with organizations and academic institutions around the globe. The CN Tower and the Art Gallery of Ontario can both be seen from the south view of the Dr. Woo Hon Fai Terrace on the eighth floor. 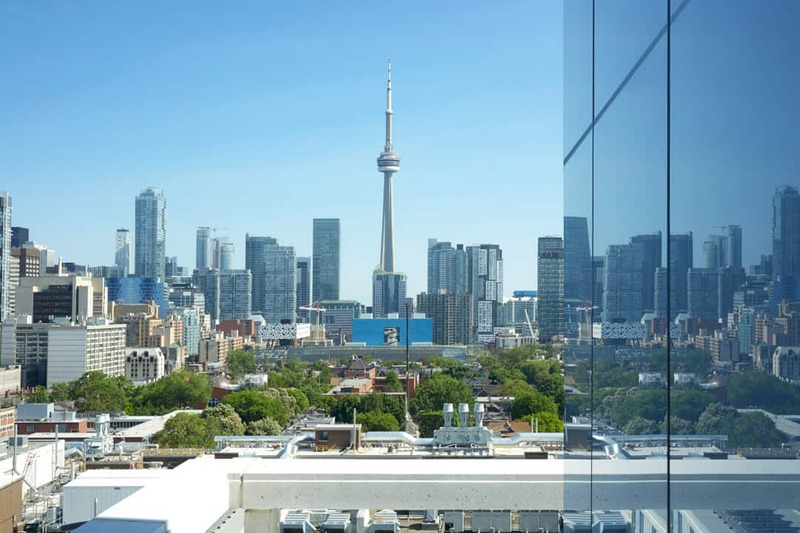 The Terrace is a space for students and faculty from across engineering disciplines to meet and take in the panoramic views of Front Campus and the Toronto skyline. This level is also home to the Institute for Sustainable Energy and the Institute for Water Innovation. Editor’s Note (September 17): This article has been updated to include a more accurate description of Level 5. An 18-year-old male U of T student has drowned at Gull Lake in Minden during U of T’s Survey Camp for engineering students. Emergency responders were called to the camp on Deep Bay Road around 4:45 pm. Minden is located about 100 kilometres north of Peterborough. Sergeant Peter Leon, Central Region media relations coordinator for the Ontario Provincial Police, told The Varsity that so far there is nothing to suggest that the death was suspicious. Emergency services were called and he was taken to the hospital, where he was pronounced deceased. According to Leon, the student was from the Mississauga area and his family has been contacted. The victim’s name has not been released. An investigation into the death is currently being carried out and a postmortem has been ordered by the coroner. The death was confirmed by a statement from the U of T Engineering Society and the Civil Engineering Club. The rest of the week’s programming has been cancelled and the other students returned home Tuesday night. The survey camp is meant to train Civil and Mineral Engineering students in land surveying and engineering project management. The facility has been in operation since 1920. If you or someone you know needs help processing this event, you can visit the Health and Wellness Centre at the Koffler Student Services Centre at 214 College St. or over the phone at 416-978-8070. Editor’s Note (September 5): This article has been updated to include comment from U of T and Haliburton Police. Ten years in the making, the Myhal Centre for Engineering Innovation & Entrepreneurship will be ready for use this year. Development began as early as 2008, with construction starting three years ago. Full occupancy of the building is expected by June. The site was previously used as a parking lot, and was chosen for development due to its proximity to the Engineering Annex building on St. George Street. 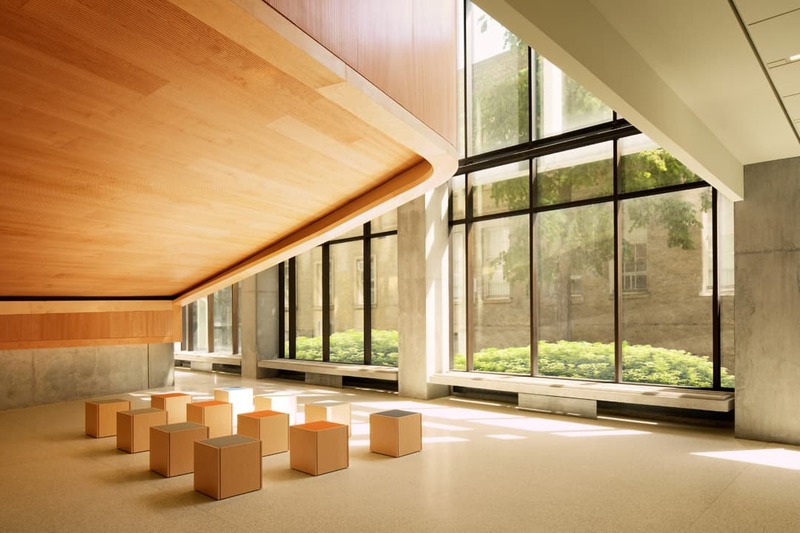 As with all other U of T buildings, the Myhal Centre will be open to the general public. Certain spaces, however, will be restricted to engineering students only. “As a world-class engineering school, our priority is to provide spaces that enable active, experiential learning and collaborative multidisciplinary research,” Riddell said. Unfortunately, the building’s history is marred by tragedy. On September 8, 2017, an accident at the site resulted in the death of 52-year-old construction worker Tim DesGrosseilliers. One other worker suffered injuries. U of T’s Faculty of Engineering has received a substantial donation from an alumnus. The estate of Erwin Edward Hart, who graduated with a degree in civil engineering in 1940 and was the Chief Welding Engineer for the manufacturing company Massey Ferguson Ltd, left a bequest of $20 million to U of T’s Faculty of Applied Science and Engineering. The donation will fund the Percy Edward Hart and Erwin Edward Hart Professorships. Percy was Erwin’s father. Seven faculty members in the first ten years of their career will be nominated from among their fellow faculty members to receive financial support from Hart’s fund. The chosen professors will be given $75,000 annually for three years to conduct research. Among other departments, this extends to the Department of Chemical Engineering & Applied Chemistry, the Department of Civil Engineering, and the Department of Electrical and Computer Engineering. Furthermore, the donation contributes to the engineering portion of the Boundless campaign for the University of Toronto. Currently, $180 million has been raised for the engineers, with an engineering-specific target of $200 million.